Taste test: These are red-powdered type chips that have a big heat kick at the beginning of the taste experience. In other words, don't lick these chips unless you have a high tolerance for heat. The aftertaste kind of gives you a kick as well, that works toward the back of your throat for a while. I think if you eat a lot of these chips you'll be reaching for the water. 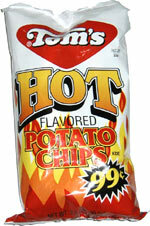 Of course, I'm a wimp when it comes to hot chips so this might not be as impressive to our other hot-chip veterans. Smell test: They smell similar to a bag of jalapeno-type chips.